The dining room area is finished! We started working on the space back in August and we finished up today, ten months later. I reviewed my first post about the dining space today and snickered to myself a bit. I seriously thought it would only take a couple of weeks?! Ha and HA! I tried hard to keep the cost down on this space, so for the finishing touches I re-purposed a few things from around the house. The last little details are the most fun part of a project, aren't they?! The centerpiece is a trio of simple mother-in-law-tongue plants. Supposedly the plants tolerate low light and are very hard to kill, so they should do OK in this nook. I bought the whole set-up at Walmart; plants, glass containers, dirt and a HEAVY bag of river rock. Side note - the small packages of river rock in the floral department are overpriced. Go to the garden section and buy a fifty pound bag for three dollars, they just need to have the dirt/dust sprayed off. I made the "Hang Art Here" piece a few months ago, using a re-purposed thrift store frame and print. The other two frames were in storage, they just needed some white paint and now they work nicely for showing off B's artwork. The large "B" initial was on the wall in his room, but I don't think we'll have room for it once my plans in there are finished. 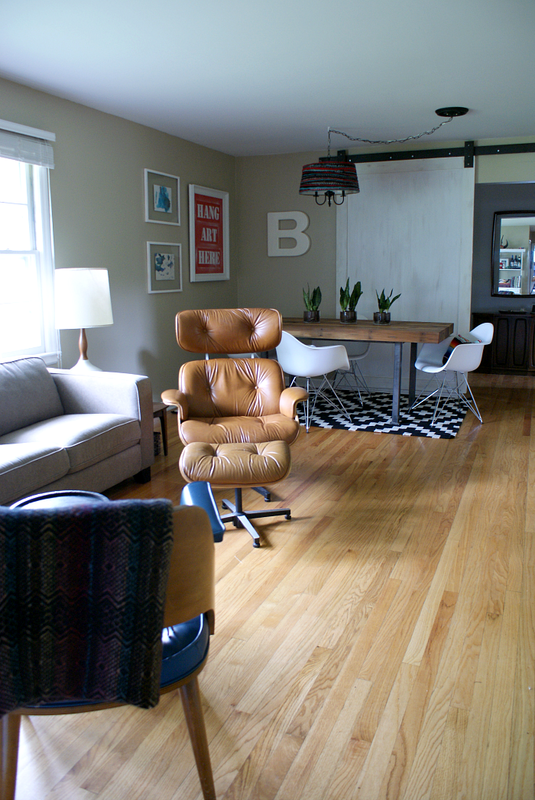 The final touch was adding a couple of lumbar pillows to the eames style chairs. I used half a yard of fabric for the blue and gray one. The striped lumbar pillow is made from a three dollar thrift store blanket. Poly-fill isn't what I'd call "expensive" but when trying to mind every penny for a project, it's just another expense I try to avoid. For these lumbar pillows, I cut open two old square toss pillows and used their stuffing. And because everyone loves a good before and after image (right?! ), here's one of our space. I get goosebumps whenever I looks at this! Here is the cost break down and resources. If you have questions about anything, please give me a shout. Comments make my day! Custom dining table - FREE - love my talented husband! I realize not everyone can make a dining table. I think a great alternative here would be a vintage cottage-y table with a bright coat of chalk paint. Love this! What a gorgeous room! i love your vintage vibe. looks great, and the art sign is super funny. That room looks great and the table is awesome! Are there any instructions that go along with that table? I'm sorry, we don't have instructions, but I think he took progress photos, maybe we could put something together. Have a great day! Coming over from the party at Remodelaholic. Love how your room turned out. The art, table and pillows are all perfect! What kind of wood is the dinning room table? It is beautiful! You are extremely talented! If you lived in my neighborhood I'd hire you to help me design my space! Job well done. Keep up your great design work.